At a time where sports sponsorship rights are soaring, brands are fighting for position. Marketers are throwing millions of dollars at sports properties, teams and leagues such as the NFL, NBA, MLB, PGA Tour and even eSports in hopes of cutting through the clutter and securing a fresh piece of exposure within a lucrative demographic and extensive fanbase. In what is becoming a battle of the titans for an association with global sports, how could a Houston-based non-profit organization even think about competing? Especially if the singular mission of the brand is to put an end to cancer—which takes untold numbers of millions of dollars in research? MD Anderson Cancer Center, which was again ranked No. 1 for cancer care by U.S. News & World Report’s annual “Best Hospitals” survey in August, may have found the sweet spot with a little help from their friends. 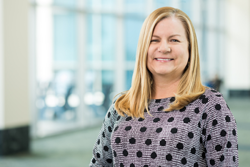 MD Anderson’s Director of Sponsorship Suzan Sherburn, who once spent 11 years as corporate brand director at UPS, sat down at the PGA Tour’s playoff opener last weekend, The Northern Trust in New Jersey, to discuss its journey into the world of sports. EVAN VLADEM: MD Anderson is slowly developing a very diverse portfolio in arts and sports sponsorship, which includes the PGA Tour—your largest deal. What is the biggest goal and takeaway around your deals? Is it brand awareness or donations? SUZAN SHERBURN: It’s both. What we learned through a sponsorship platform is that we can achieve several goals and awareness is certainly one of them. We are very well known in Houston and throughout Texas but when you get outside that area, our awareness tends to drop off a little bit. Having a national sponsorship helps us build that awareness as a national brand and even a global brand. We have partners and hospitals all over the world, we really are a global brand. EV: Explain the evolution of the hospital’s push in sponsorship, especially in sports. SS: When I joined in 2011, our only sponsorship was the Houston Rodeo, which was in our backyard. It was more of a community-driven event. We saw a lot of opportunity in sponsorship and wanted to figure out what made sense for the brand. It started with Health Conferences in New York City. We aimed more at thought leadership—getting our doctors and scientists exposure within a big media market. But soon we realized that we needed a break into experiential marketing. We got that with IndyCar’s Grand Prix of Houston and naming rights for the track—the MD Anderson Cancer Center Speedway. We flew a massive flag over the raceway with a message to end cancer. Attendees could buy a flag for a loved one and fly it over the race track during the race. EV: You gave those fans a meaningful memory. How did that develop into a national approach into sports sponsorship? SS: We knew that there were so many more things that we could do. Our chief physician at the time was treating [renowned PGA Tour golfer] Phil Mickelson’s wife, Amy, and Phil introduced us to the PGA Tour. We started a conversation and were convinced there were things we could really do together. Our leadership wanted to push prevention because 50 percent of all cancers can be prevented by lifestyle changes: sunscreen, no smoking, a healthy diet and exercise. In 2015, prevention and education were big focuses when we initially launched our PGA Tour sponsorship. At golf tournaments free sunscreen was not available and that seemed like a missed opportunity. We partnered with a few sunscreen companies to provide 200 gallons of free sunscreen during the tournaments over the first three years of the deal. We now have eight kiosks around the course, which reminds people to apply sunscreen every few hours. There also isn’t a lot of shade at some golf tournaments, unless you’re in a hospitality tent. Most attendees are sitting on the bleachers with no shade so we worked with the PGA Tour to provide branded overhangs on some of the bleachers. EV: You’ve also provided about 1,000 free skin cancer screenings over the three years of the partnership, how do the professional golfers fit in? SS: The players themselves don’t always get screened because they are on tour and don’t have time. We started bringing our doctors to do skin screenings for players and caddies. It has been wildly successful. The players all have our doctor’s numbers on speed dial now. EV: Did you have any concerns about sponsoring the tour? SS: My initial concern was how do we break through the clutter? We found a way to do that by being authentic to our brand. We have to be authentic, we have to stay on mission. If we just come out here with hospitality or just hand out Koozies, that is not going to do much for our brand. Everything we do is very mission driven. What we hand out; sunglasses, lip balm and sunscreen, as well as the screenings, all ties back to prevention. EV: As a not-for-profit how do you work strategic deals such as cause into your portfolio. Are properties open to helping you? SS: We still have a way to go to get people and some companies to realize the value of that. When I have talked with other properties, they ask, ‘what does success look like for you?’ I say, ‘that you see us number one as a cause, number two as a marketing partner.’ It’s unique and it takes a while for people to get that we can be both a marketing partner and a cause at the same time. EV: Are negotiations different from your UPS days from a monetary standpoint? SS: I always ask for a non- profit discount. The more we spend, the less we can give back for critical research. Part of why we try to raise funds is to offset our marketing spend and we have seen that go up quite a bit over the last few years. 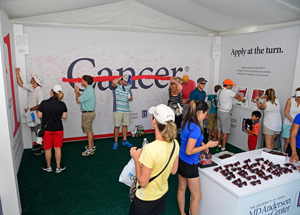 EV: You also have a MD Anderson Strike Through Cancer Wall featured at several tournaments for spectators to sign. How has that been going? SS: We worked with our agency partner, MMI Agency, to come up with that concept at a community event in Houston. It was so popular we wanted to do it during golf tournaments. People really reacted to the wall, some were even crying because they would think about their loved ones. We knew we were on to something that was making an emotional connection with our brand. EV: What’s next in terms of sponsorship for MD Anderson? SS: We are currently working on a big sponsorship that we’re going to announce in the next couple of months. It will be a significant new partnership in sports that will give us additional awareness and reach for a whole new market. EV: That is exciting. Is sports working for you? SS: It is working, and our leadership sees it is working. They see that this is great for the brand.